Sellacious focuses on better management of store not overlooking the need of variant of marks required in presiding over the currency of the store, We have dealt with the situation for you offering various features to set the currency of your store just so businesslike. Different currencies come with different symbols and format. Sellacious has been designed to edit the positive and negative separator, decimal places and symbols so that you can customise it according to your needs. To make the operations and concept of currencies easier and simplified, Sellacious lets you set 2 letter and 3 letter codes to currencies to use them in store. Taking in accounts the need of representation of currencies internationally, used in computerised systems. We know the pleasure and importance of being able to offer your customers ease, comfort, access and preference they need. 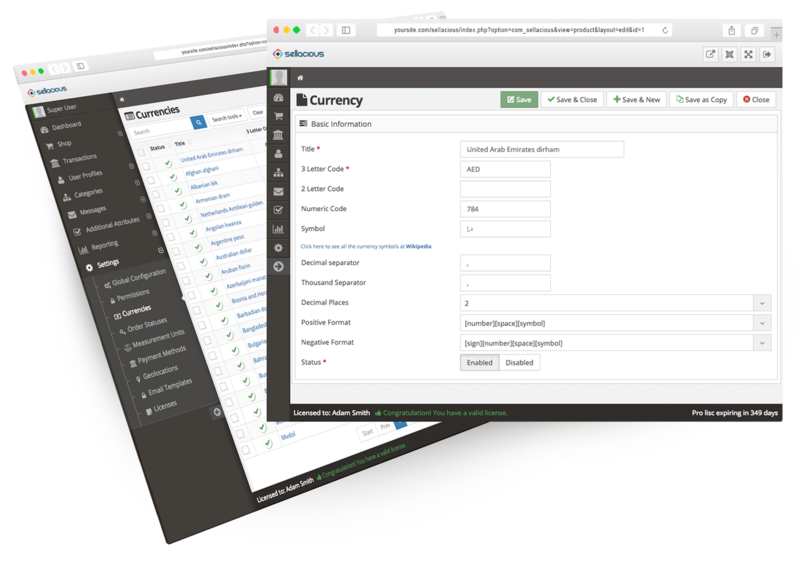 Consequently, Sellacious lets you give options to your customers for setting up their own preferred currency. What better than automation? Show product prices to your customers in their local currency. This setting identifies the customer currency from the location provided by their IP address. Just so likely to your store, Sellacious has made sure to wedge the most of the currencies used worldwide. Still, If we have not managed to impress you with this, you can even add yours or modify the predetermined ones with just few clicks yourself. With a single click, Sellacious can fetch forex rates according to your store currency. This click process can be automated using cron jobs as well.